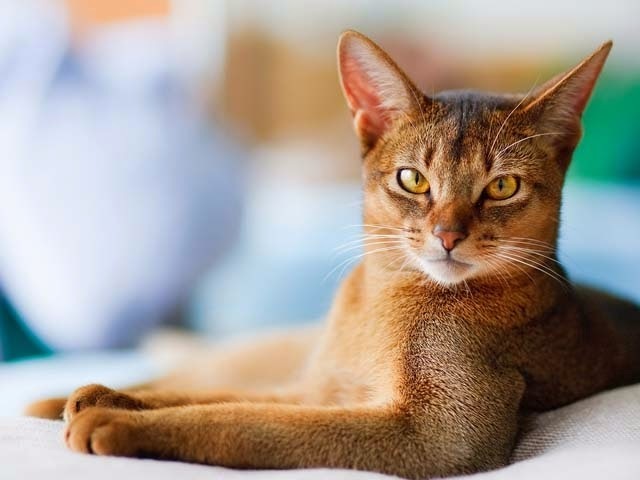 The Abyssinian is a natural breed of domesticated cat believed to originate from one Egyptian female kitten called Zula that was taken from a port in Alexandria, Egypt, by a British soldier and brought to England. The breed was developed when Zula was bred with an English tabby, and the most 'Abyssinian' looking kitten of her litter bred with its mother to splice the Abby gene. It is believed all Abyssinians in Europe, the Americas, and Australia are descended from Zula, but there has been at least one and possibly as many as three Abyssinians introduced from Libya (or less likely Egypt) into the existing Abyssinian gene pool in the USA. The Abyssinian has become one of the most popular shorthair breed of cats in the USA. There are said to still be wild Abyssinians in some parts of North Africa. Abyssinians are very active, friendly, curious and playful, and almost dog-like, but are usually not "lap cats", being too preoccupied with exploring and playing as they would in their natural habitat. However, "abys" will also usually adopt one person in the household and become their best friend, often becoming a lap cat as they are extremely affectionate animals. They are "busy" cats, and can get bored and depressed without daily activity and attention. Many Abyssinians enjoy heights, and will explore their surroundings in three dimensions, from the floor to their owner's shoulders to the top of the highest furniture. They are highly intelligent, and very independent. There is a long haired version of the Abyssinian, called the Somali.